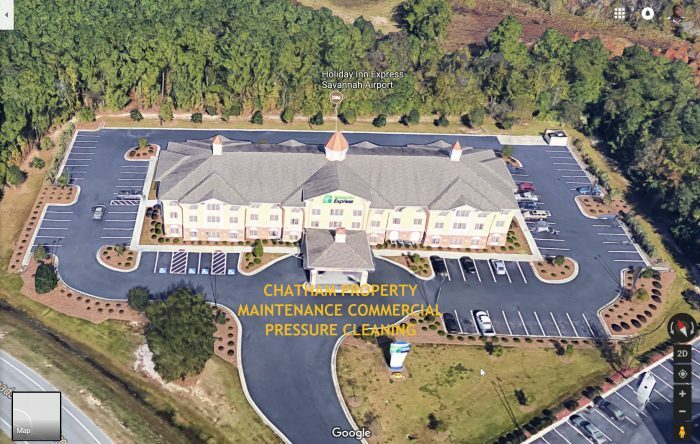 No matter the size of your commercial pressure cleaning project Pressure Washing – Savannah GA has partnered with Chatham Property Maintenance to provide our commercial clients the experience and equipment to provide you with exceptional commercial pressure cleaning services. To the right, you can click the photo and watch a video demonstration of us pressure cleaning. This pressure cleaning project took approximately 8 hours. Our professional equipment allows us to safely clean up to 5 stories from the ground. Why Choose Us? Commercial Pressure Cleaning Services! We understand the importance of a clean business. We also understand that the longer we are there the more interruption in your business. With all commercial cleaning projects, we use a 3 point system. Saftey – To ensure the safety of all people around the job. Safety is our #1 goal while we work on your pressure cleaning project. Our first goal is to determine the equipment and chemicals to provide our clients with the maximum achievable cleaning results. Our final goal is efficiency – our goal is to be on your project the least amount of time after considering parts 1 & 2 of our 3 Point Commercial Cleaning System. Since 2009 Pressure Washing – Savannah GA has provided commercial pressure cleaning services. Our service area includes Savannah, Pooler, Richmond Hill, Rincon, Guyton and Port Wentworth areas of Georgia. We have cleaned millions square feet of commercial buildings, storefronts, offices, hotels, banks, shopping centers, and industrial buildings. Our experience and be able to properly plan our commercial cleaning projects give us an advantage over other commercial pressure cleaning contractors. If you are looking for a licensed and insured commercial pressure cleaning contractor give us a call or send us a text to 912-373-7722 for your free consultation.